What better place to learn to drive than on the beautiful seaside resort of Great Yarmouth! Close to the Norfolk Broads you are never going to be too far away from some lovely views as you learn to drive around the surrounding areas of Great Yarmouth. 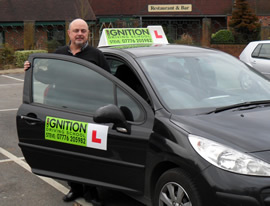 Ignition Driving School has a fully qualified driving instructor, who is available throughout the week to teach you how to drive. With no driving test centre in Great Yarmouth, your driving lessons will head towards Lowestoft and so you may need to do longer than one hour lessons to allow you the time to get used to the testing area. I've recommended Steve to lots of my friends because of his calm, patient and friendly nature; I now have many friends taking lessons with him who I guarantee would recommend him also. Steve himself is a very helpful and thorough driving instructor who teaches acronyms to assist you when performing manoeuvres. I've found my driving lessons exciting because of the fact we never drove on exactly the same route twice! I'm now more familiar with the surrounding areas of my hometown and am able to drive confidently thanks to his assistance. Thank you very much for teaching me! I started driving in September 2011 with another driving school, but the progress was slow so after about 5 sessions I began driving with Steve. My friend recommended me to him because of his competitive deals and thoroughness. He helped me quickly to become a confident and independent driver; he was always very calm when I did make errors and talked me through where I went wrong. His lessons were well planned which enabled me to work on my mistakes and pass with 2 minors. Thank you Steve.